The Hampton Inn Quakertown hotel is located in rural Pennsylvania farm country for a peaceful and quiet stay yet only minutes from downtown Quakertown Allentown Dorney Park and Wild Water Kingdom as well as shopping and restaurants. 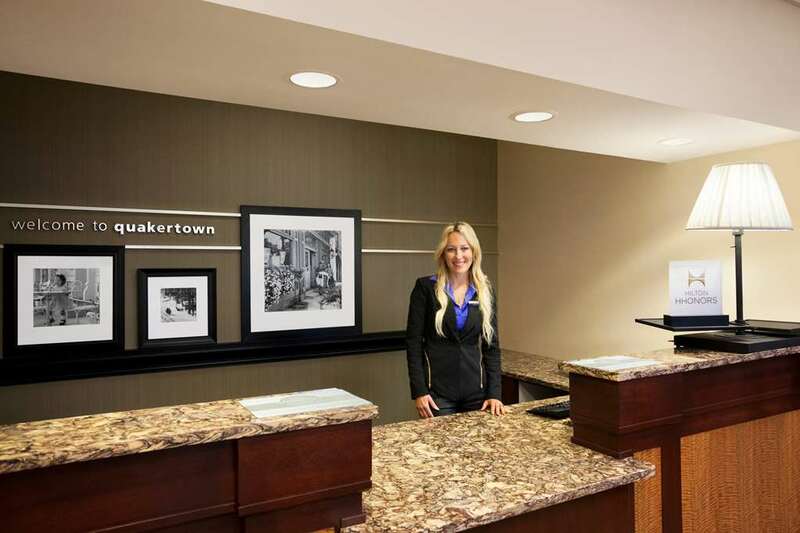 The over sized hotel rooms at the Quakertown Hampton Inn are filled with amenities including complimentary high-speed internet access and cable TV with HBO and pay-per-view movies. Guests can request rooms with refrigerators rollaway beds wheelchair showers and enjoy the convenience of an on-site coin laundry. After a busy day guests of our Quakertown Pennsylvania hotel can relax in our swimming pool or work out in the fitness center. Sure to please the busy executive or leisure traveler Hampton Inn Quakertown hotel guests will enjoy complimentary On the House hot breakfast buffet served daily near our lobby fireplace and Pennsylvania guests will have access to complimentary high-speed internet throughout the public areas of the hotel. Be sure to join us at the Manager*s Reception every Wednesday from 530pm to 700pm for pizza beer and soda. Meeting and banquet rooms are available at our Quakertown Pennsylvania Hampton Inn with audio/visual equipment and secretarial services available for a nominal fee. All stays at the Hampton Inn Quakertown hotel in Pennsylvania are backed by our 100 satisfaction guarantee. If you*re not satisfied we don*t expect you to pay. That*s 100 Hampton. We love having you here in Pennsylvania at the Hampton Inn Quakertown hotel.